Francesca Alonso is from El Paso, Texas. She teaches U.S. History dual credit at Northwest Early College High School in Canutillo, Texas, a community outside of El Paso. She has taught for six years at an early college high school. She has a Bachelors of Art and Masters of Arts in History from the University of Texas at El Paso. Her areas of interest ranged from US History, Pre-Columbian History, 20th Century Imperialism, Post-Colonial Literature to Postmodern Art. Participating in the NEH Summer Institute:Borderlands Narratives about Identity and Binationalism, provided her with resources to bridge the gap between the grand historical narrative of the United States and the regional history of the borderlands. (Note: Students should have knowledge about the Gilded Age before introducing these lessons). The second industrialization also known as the Gilded Age from about 1870s-1900s is one of the most significant time periods in American history. From the bessemer process to the refining of oil, the United States experience a rapid industrial change. The United States aggressively made efforts to “close the western frontier” through Indian wars that would led to the Dawes Act, the Transcontinental RailRoad, Homestead Act, and the mining of minerals and metals. This are only a fews events that would led to the transformations of the western frontier by United States industry. In the backdrop of the Gilded Age, the United States was looking beyond its borders for territorial and economic gains. As a result of the Spanish American War in 1898, the United States acquired the Philippines, Guam, and Puerto Rico as well as economic control and oversight of Cuba due to the Platt Amendment. The United States also annexed Hawaii and began trade with China. Mexico also became of interest making El Paso, Texas the gateway border city along the U.S. Mexico borderland. Copper and lead-silver traveled to El Paso from mines throughout Mexico. Rail lines connected mines to major railways such as the Mexican National Railroad, the Santa Fe, and Southern Pacific. El Paso became central to processing the minerals crossing borders. In 1887, a smelter was established in El Paso which would become known as ASARCO. The purpose of this lesson is to understand and contextualize the global, national, border, and regional impact of industry during the Gilded Age. 2. Describe the experiences of the immigrates/migrates along wth US Mexico Borderlands? 3. How did industrialization influence immigration? 113.41. United States History Studies Since 1877 (One Credit), Beginning with School Year 2011-2012. (a) General requirements. Students shall be awarded one unit of credit for successful completion of this course. (2) To support the teaching of the essential knowledge and skills, the use of a variety of rich primary and secondary source material such as biographies, autobiographies, landmark cases of the U.S. Supreme Court, novels, speeches, letters, diaries, poetry, songs, and artworks is encouraged. Motivating resources are available from museums, historical sites, presidential libraries, and local and state preservation societies. (D) describe the optimism of the many immigrants who sought a better life in America. Otis Aultman took this photo of the ASARCO plant. The copper smelting plant opened in 1910 and closed in 1999. Project the current US Union Pacific mapmap. Ask students the following: why are railroad important? Students will examine the map and write a reflection on their understanding of the map. Student will share their reflections with the class. Write down key terms that are being used on the board. Project an image industrialization from 1870-1900s. (The image can be an image of a smoke stacks, child labor, tenements housing, and the raid roads). Ask students the following: Based on the image describe industrialization and its effects on society? Students examine image and write a reflection answering the questions. Students will share their responses with a partner and further discussion with the class. Be sure to print and display photographs around the classroom before the lesson. Students will analyze photographs of ASARCO from 1880s-1900s to understand the impact industrialization had on society. Provide each student with a copy the Document Analysis worksheet for each photograph. Students will complete the analyze worksheet independently. Oral History lesson will be the final part of a three part lesson series which covers the Asarco plant in El Paso, Texas. The purpose of the oral history activity is to provide different experiences amongst workers and families of Asarco workers. Furthermore, it sheds light on the bigger experiences of industrial workers at the turn of the century and how race, class, gender, and religion all provided contradictions and nuances throughout the industrialized world. Students will all possess a role as either an interviewer (this individual just asks questions) Note; question rubric and tips will be provided below, an interviewee from the oral history site as either 905, 914, and 915 that will only provide answers from the questions posed by the interviewer, and lastly a scribe. The scribe will document the questions and documents provided by the interviewee. After interview students will then rotate and will be in charge of a new role as either an interviewer, interviewee, and scribe. Complete cycle until all students have finished all three roles. Note: Interviews should last roughly around 20 minutes. Below are the questions that the interviewer should ask the interviewee. Where was your family from? Describe the community you grew up in. Describe any economic hardships your family experienced. Was your family affected by war? 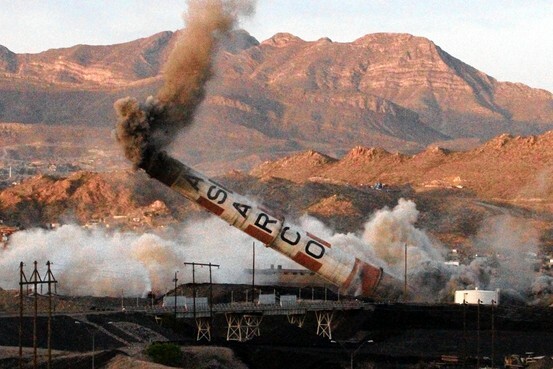 How does your family and you remember the Asarco plant? What was your relationship with religion? After students have completed all three cycles of interviews, a discussion amongst the three students will commence. Time necessary for discussion (15 minutes) The purpose of the discussion is to help facilitate any misconceptions and confusion of the individual interviews. Questions that students can ask and identify are: What similarities were found amongst the three? What were the main divisions amongst the three? Furthermore, it will help the students make connections among the three individual interviews. Expository Essay: Students will write a 1-2 page essay based on the analysis worksheet. Students will research their own family’s history in connection to mines and railroads. Students will create 5-10 questions about immigration, occupation and family origins. Once questions have been approved, students will work in pairs to conduct an oral history of a family member. The interview can be recorded with a cellphone, or recorder. Encourage students to take notes during the interview. Students must transcribe the interview. Student will create a “counter cartography map”. Students will map their family's history in connection to industry and railroad. By mapping their family's history, they will be able to address the guided questions: How did industrialization influence immigration to the US Mexico Borderlands? Describe the experiences of the immigrates/migrates along wth US Mexico Borderlands? How did industrialization influence immigration? Student will present their work to the class and community (if possible) with a 5-10 minute presentation using any form of media such as powerpoint or video. Images: Contextualize the lesson by providing additional images of industrialization from across the U.S. from 1870s-1900s. Readings: Assigned chapter one “Making a Border City” and chapter two “Creating a Smeltertown” from Smeltertown: Making and Remembering a Southwest Border Community. This will allow students to have a complete understanding of El Paso regional history in the context of Industrialization from 1880s-1900s. Research: Students will compare an industrial city with El Paso, Texas during the Gilded Age. Provide students with a list of possible topics to focus on, such as monopolies, Robber Barons/ Captains of Industry, tenements housing, immigration, labor issues, international influences. Students will create a visual presentation that comparing the two cities and the impact of industrialization. Further and deepen students understanding through a class discussion. Ask students the following questions based on the information they have gathered and learned. Which borders are being crossed? Based on the maps, how do policial border change? What are the transnational borders industry? How might industrialization influence immigration and migration during the Gilded Age? Write students responses on the board as they share their answers. Modified Lesson: Model lesson by showing students how to read a map. As a class analyze one of the maps. Students will answer the questions as a group. Note: Adjust lesson according to students’ needs. Using the document developed by the Texas Education Agency (TEA) and the Texas Higher Education Coordinating Board (THECB), the following College and Career Readiness Standards (CCRS) complement the lesson plan in English/language arts and social studies. "Maps of the Union Pacific." UP: Maps of the. N.p., n.d. Web. 25 July 2017. Perales, Monica. Smeltertown: Making and Remembering a Southwest Border Community. N.p. : U of North Carolina, 2010. "Principles and Best Practices." Oral History Association. N.p., n.d. Web. 28 July 2017. "Where Do We Move Freight?" Ferromex. N.p., n.d. Web. 25 July 2017. Our immersion in the program with the readings and lectures made us realize the cultural, economic, and ethnic significance of the ASARCO smelting plant. We believe the ASARCO plant not only presents life on the border but also the evolution of industrialization throughout North America. We decided to collaborate on a unit that student taking a U.S. History course struggle with the most, the Gilded Age. By focusing on ASARCO we hope that students will have a better understanding of impact of industrialization. We were inspired to contextualize and regionalize this time period of U.S. History and give meaning to students who have little or no knowledge of early industrialization along the borderlands.